﻿ The Canary Wharf Treasure Hunt. Canary Wharf and its surroundings have been described as "London's Manhattan" and, on this treasure hunt, you will find out just how accurate that statement is. Beginning with a lovely amble past some delightful old warehouses, this challenging quest will pick its way through the Docklands old and new and will have participants heads spinning in all directions as they encounter truly stunning vistas and genuinely curious locations which will combine to create a truly memorable team building exercise. One of the most remarkable things about Canary Wharf is just how much art there is to admire. Indeed, this relatively compact enclave boasts one of the United Kingdom's largest collections of public art. So, you're in for some wonderful discoveries as you make your way around the route. Which means that there will be plenty to occupy the teams as they set off to hunt out the series of cryptic clues that are located in plain site, but which can so easily go unnoticed by all but the dedicated seekers who have been tasked with finding them as part of a treasure hunt challenge. Indeed, even if you work in Canary Wharf, we'll warrant that you'll uncover so many things that you didn't know were there that you'll emerge from this team building quest with a completely different perspective on the area than that with which you went in. But, of course, the mark of a good treasure hunt is the challenge and so, having assembled your motley crew of Docklands desperados you'll head off along a picturesque dockside and, from that point on, clues and challenges will come thick and fast. Now, although the clock will be ticking - and, let's be perfectly frank about this, time and resource management is an important factor in a team building exercise - the challenge of the Canary Wharf and Limehouse treasure hunt quest is not to race around and finish first, but, rather, it is to observe your surroundings and find snippets of information that can combine to give your team ultimate and absolute victory. You won't know exactly when the answers to your challenges will actually turn up, nor will you know where they will turn up; in fact, the only guidance we can give is that they will turn up; so you will need to be alert at all times, and you'll need to scout your surroundings for any tell-tale sign, such as a hidden plaque or an obscure information board, that might lead you to the answer to one of your challenges. We're glad you asked such an insightful question! The information that you will be asked to search for will consist of a wide variety of fascinating facts and riveting history. For example, do you know where the World's most expensive stretch of road is located? No? Well, don't worry because you'll stand over it as you seek the solution to one of the cryptic clues. 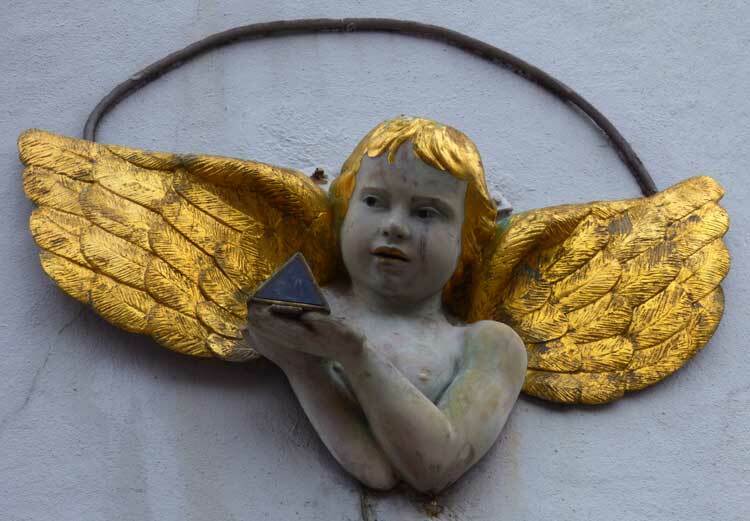 Have you ever noticed the cherub on the wall that is pictured here? Would you be able to point out its exact location, were victory for your team to depend on it? Hopefully, by the time you're well into the treasure hunt, you'll have found the clue that this local curiosity features in. Have you ever wondered what a hydraulic accumulator tower was used for? If you have, then your wondering will be at an end by the time you cross the finishing line of this cunning quest. Have you ever asked yourself - or, for that matter, has anyone ever asked you - how people ensured that they woke up in time for work in the days before alarm clocks? Worry not, once you've completed the treasure hunt you'll never be troubled by that question ever again, and the next time someone asks you, you'll be able to look them square in the face and, assuming the sage countenance of an avowed know-it-all, tell them, "well, actually, they used to......."
Do you know what Henry Potter was up to on the 11th March 1904? Probably not. But, rest assured that, by the time you arrive puffing and panting at the bar of the final venue, you will, most certainly, have uncovered his secret. These are the sorts of things that you are going to discover during the two or so hours that it will take you to complete the Canary Wharf and Limehouse Treasure Hunt. In fact, there will be so many Intriguing facts and fascinating pieces of history that you will find yourself transformed into the undisputed Stephen Fry of any dinner table. Unless, of course, you happen to be dining with others who have completed the challenge - or with Stephen Fry himself - in which case, things could get nasty! One of beauties of this particular treasure hunt is the way in which it juxtapositions the new with the old. 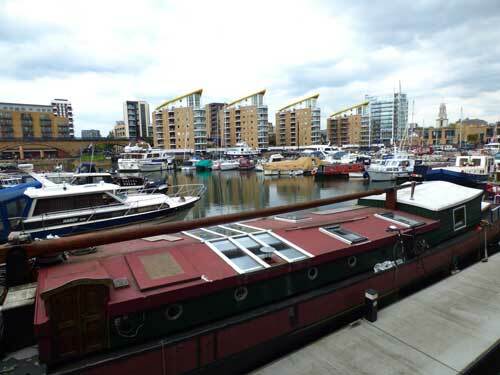 For, no sooner have you started to be amazed by just how much there is to be discovered around Canary Wharf than you're plunged into the picturesque depths of the Limehouse Basin and, suddenly, it's all change on the amazement front. This is such a lovely and picturesque place. Yachts and barges bob gently on the sun kissed waters, and an air of timeless tranquility holds sway. Until, that is, you and the competing teams arrive to start looking for the clues and photo challenges that are dotted around the quayside. Then the waters will turn decidedly choppy, and the gentle ripples will be transformed into a veritable tsunami of competitiveness as teams duck, dive and delve in ever more desperate attempts to outwit one another and emerge from the basin's hinterland with the clues found, the observation questions answered and the photo challenges uncovered. Incidentally, just in case you are wondering, the Limehouse Basin section remains on dry land, so you won't be required to jump in and swim in order to solve any of the challenges! Via some delightful docklands backstreets, your team will arrive on the banks of the River Thames to enjoy an absolutely stunning vista of Canary Wharf and its surroundings. However, don't waste too much time admiring the view as you'll still have several challenges to complete before you arrive at the final venue of what will have proved an enjoyable treasure hunt. Indeed, our final venue is a riverside hostelry that is so steeped in history and so unaltered by time and progress that you wouldn't be in the least bit surprised if, on crossing its threshold, you found Charles Dickens sitting at one of the tables. So whatever the reason for your wanting to explore this fascinating area, be it a team building exercise, an office social, a birthday, hen or stag party, the Canary Wharf and Limehouse Treasure Hunt will allow you to really get under the skin, so to speak, of a part of London that is unique in both appearance and character. 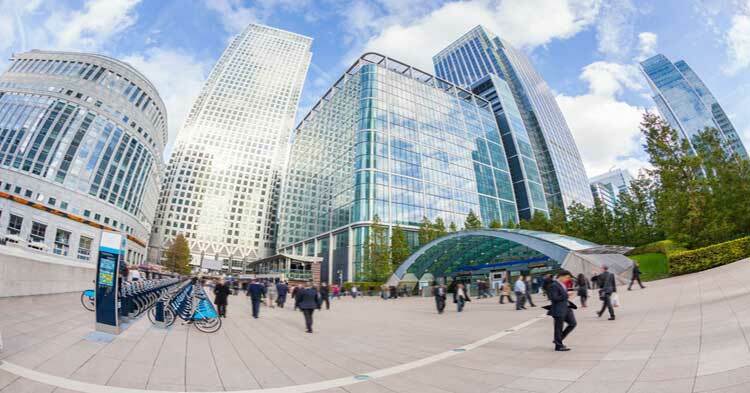 The cost of the Canary Wharf Self Managed Treasure Hunt Package is £140.00 for 4 packs. Outside West India Quay DLR Station.